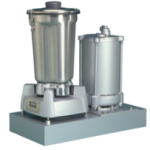 Eberbach’s large capacity Variable-Speed Orbital Shakers are designed for rotary swirling action and is used for bioprocessing of plant cell cultures, large batch mammalian cell culturing, aeration of fermentations and various other chemical mixing procedures. The E6155 uses Eberbach’s own controller which has a digital tachometer along with digital countdown timer and optional audible end of cycle alarm. The digital countdown timer can be selected for timed operation or turned off for constant operation. The eccentric drive is counterbalanced to assure smooth acceleration and minimal bearing wear for increased life of the machine. Speed is continuously variable between from 32 – 320 rpm or with the Eberbach controller you can program your specific speed. Eberbach’s variable speed Explosion-Proof Blender E8018 is designed for laboratory situations made hazardous by the blending of mixtures containing volatile solvents. Unit features a 1.5 hp explosion-proof motor with automatic reset thermal protection. The E8018 is designed to accommodate a Waring® 4-Liter blending container (E8020 not included).The explosion-proof motor is UL approved (applies to motor only) for Class l, Group C and D and Class ll, Group F and G operation. It will provide constant torque in a speed range from 1,150 to 11,500 rpm. Blender is powered by a PWM scalar drive and speed is monitored by a digital display. The E8018 is designed to use a 4-Liter container but, you can use an adapter unit to fit all Eberbach blending containers with the use of a Model E8051 adapter. The Model E8018 must be installed by a qualified electrician to preserve their explosion-proof capability. Units are supplied without container or adapter, these can be purchased as an option. 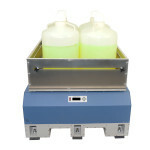 The EL655.I Programmable Incubator Tumbler is designed to optimize cell growth in small volumes by improving suspension, aeration and temperature control. The EL655.I keeps fluid moving in a gentle way while increasing the surface area of the liquid air interface for improved cell aeration. The EL655.I can also be used for more aggressive mixing with temperature control applications by programing the tumbler to rotate clockwise stopping and then rotating counterclockwise and can repeat this cycle as many times as required. The EL655.I is designed to accommodate 2ml, 15ml and 50ml tubes as well as other containers up to 7 inch long and 3 inch diameter (other sizes are available upon request). The EL655.I does not come with tube/bottle/container clamps; these are sold separately and can easily be changed depending on applications. 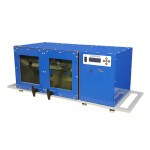 A tempered glass window is positioned in front of the unit for viewing inside the incubator. When mixing photosensitive samples the built in sliding shade can be used to block off all light from entering into the chamber. The interior chamber itself is constructed of polished 316 stainless steel ease cleaning.